Are people sympathetically up-voting bad questions that have been down-voted? Who in their right mind would up-vote such a ridiculously awful question? I tend to see this late at night, and suspect that it's because someone (me) from a different timezone downvoted and left the sarcastic comment. How can one hope to improve the quality of questions on SO when people up-vote crap like this? You're assuming all people see "good" and "bad" in the same way. If there are people who think those are good enough questions to ask, then there are people who will think those are good enough questions to up-vote. The same type of person who would ask such a ridiculously awful question. Who are these people, you may ask? Probably those with excessive laziness, lack of respect (for oneself and others) and/or total and utter obliviousness. Someone who favours usefulness and largely ignores quality. We strive to have a high-quality site. This behaviour is actively harmful and definitely part of the problem. Lack of seeing the bigger picture? Definitely. There are plenty of possibilities to deal with this, but a necessary precondition is that the SE staff realizes that this is a problem and are more open to suggestions. Perhaps the upvoters felt like rewarding the original posters for attempting to contribute, even if their contribution was poor. The examples you cited are, admittedly, pretty bad. But many people believe that positive feedback is more effective at encouraging good behavior than negative feedback. After all, most of us get defensive at negative feedback, and often tend to tune out the critics. Whether upvoting a bad question is an effective method for delivering positive feedback is another issue. Other possible reasons: perhaps the upvoters misread the question. (After all, the downvotes vastly outnumber the upvotes; it seems plausible that it was just a mistake.) Perhaps the upvoter is not particularly strong on the substance of the question and therefore thought it was a good question. Perhaps the upvoter is not familiar with (or does not agree with) the approach of most people on SO and thought a general question (in the first example; the second one was incomprehensible) was a good one. I could probably think of a dozen more reasons similar to the ones above...people do things for lots of crazy reasons. I think the snarky and misleading comment does a lot more damage to the site than the simplistic question. Perhaps people are only upvoting the question because they can't downvote the comment. I believe that you shouldn't vote based on the current vote count of a question, that is, if you see a question having -2, it shouldn't make you more likely to upvote than if it was 0. You vote should be cast as if you were the only one vote, it shouldn't be cast in order to "cancel out" other votes. One way to curb this problem would be to require higher reputation - maybe 125, the same as for downvoting, to be able to upvote questions with negative votes, but I won't hold my breath for that ever to be implemented. Who in their right mind would ASK such a ridiculously awful question? The one that are specialist or at least good developer. Those one search a lot, google a lot and when they are blocked it is because of a quite complex problem, something interesting and that require other specialists expertise. I think this is the stackoverflow "purist" developer. The beginner-qualified user. Good developer that are looking for reputation point and that want to be part of the community. 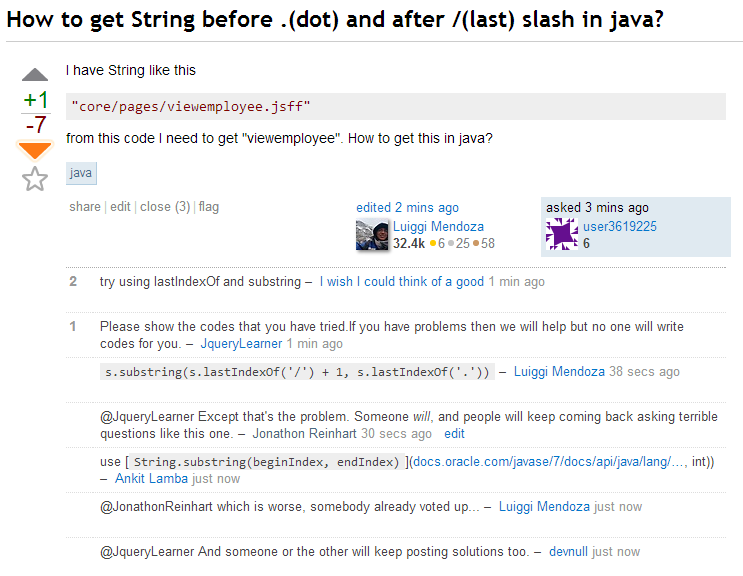 And a new type, the one that doesn't know stackoverflow philosophy and they use it as a "do my research work for me". They maybe think that stackoverflow is a kind of board, ask a question, usually stupid, and as soon as they got their answer never come back. They can't help and don't even try (maybe because they can't). The problem is that this last type is pulling S.O. down. The feed is full of stupid, ininteressant and very basic question that can be answer by Google in two clicks. There are tons of tutorials and that is not the S.O. purpose to answer stupid basic questions when there are ten times duplicate. And the one which upvote and support it are the second type that are looking for easy reputation point. And the one looking for interesting question can't do anything cause every interesting question is answer in the minute as everybody rush at it, and other are just too basic. But as some peoples says those people are beginners and may become experts. We all have been beginners at a time, so I am not for the extreme "get rid of them" solution. Maybe creating a new platform especially for beginners where other beginners can help them could be a solution. And once they become better they switch to classic S.O. Beginners helping each others and professionals helping each others. That's my opinion, I am not an expert, but a professional that has been helped a lot by SO and want to bring something back to it. If your assumption is that sympathy upvotes of these types of questions are decreasing site quality, then that assumes that askers of these questions are encouraged/discouraged from asking such questions based on overall score. If you look at the username and rep you'll realize these types of users are here for answers, not reputation. Up/down votes mean nothing to them and will not change their behavior. The overall negative score warns other users away from wasting time on the question. If you want to modify the users behavior, then a comment goes much further. As another said, we tune out critics when the criticism is negative. If you can offer a suggestion for how the question can be improved, then that will set a foundation for good behavior. If you slap a dog because he didn't sit, he will never learn to sit cause he doesn't know what it is you want him to do. A little hand holding to guide someone into improving a question goes a long ways. And then in the future maybe they'll have a better idea as to why they are getting downvotes and no answers. Often times I will withhold making an attempt at an answer until the asker has provided sufficient information. That's the carrot they want. Comments also show the asker that there is some interest in answering the question once they've put some decent effort into it. I think people see downvotes on a sliding scale. SO users are happy to see truly terrible questions get 10+ downvotes. Merely mediocre questions deserve to be downvoted but not as much, hence they'll upvote if they see the amount of downvotes as "unfair". This is actually how I used to think (as evidenced by this question three years ago). Sympathetic voting is as bad as agressive downvoting, which at places looks absolutely unnecessary. Another thing you "left a sarcastic comment" I guess that is a problem in itself. P.S. A question! What you "belonging to a different time zone" have anything to do with those upvotes (and I agree wrong/sympathetic upvotes)? I didn't read all of the replies so this could have been said already.. what if there was a way to link questions together. It seems a lot of these questions have been answered before somewhere else on the site, so if you could group them all together then the answers for these simple questions would be better organized and more easily searched for, reducing the problem. maybe?? It's obvious that the OP is a newbee and downvoting is likely to scare them off. IMO, people should be encouraged to come to the site to learn - it should not just be about big time experts "scratching each other's backs". So encouraging with upvote and providing guidance in a comment and/or vote to close seems appropriate to me. Nobody is going to be garnering thousands of rep points from newbee questions and "sympathy votes", and you're not losing anything with the upvote. In general I am very reluctant to downvote questions unless they are just plain stupid and show blatant negligence or malice. A naive newbee doesn't deserve a downvote IMO. Let them feel good and teach them. Their questions will improve, and the site at large will be the better for it in the long run. It amazing me all the people on here who whine about simple questions. For goodness sake... These people are beginners trying to learn how to program. They aren't masters of Google search (yet). Call them lazy. Maybe they aren't in the same mindset as you on how to solve problems. They are asking basic questions and think this is the place to do it. This place is a buzzkill for beginners. People sign up and get downvoted to hell on their first questions. I doubt they ever come back. I've never had trouble sifting through bad questions to find an answer. I get people want to improve quality but if the question is clear and concise, I don't get the point of downvoting it or closing it. I still run across plenty of answers that have been closed. They still show up in search engines, so you guys are accomplishing very little other than hurting the advertising profits of the company by turning away new people. The PHP question I agree, but someone asking how to parse a string... Ok, so no one ever had to look up how to do parsing the first few weeks they started programming? Not the answer you're looking for? Browse other questions tagged discussion voting low-quality-posts upvotes . Should it be strongly recommended to upvote the question you just edited? Is bandwagon voting thru chat voting fraud? How to politely get users frequently asking basic/related questions to slow down and do better research?